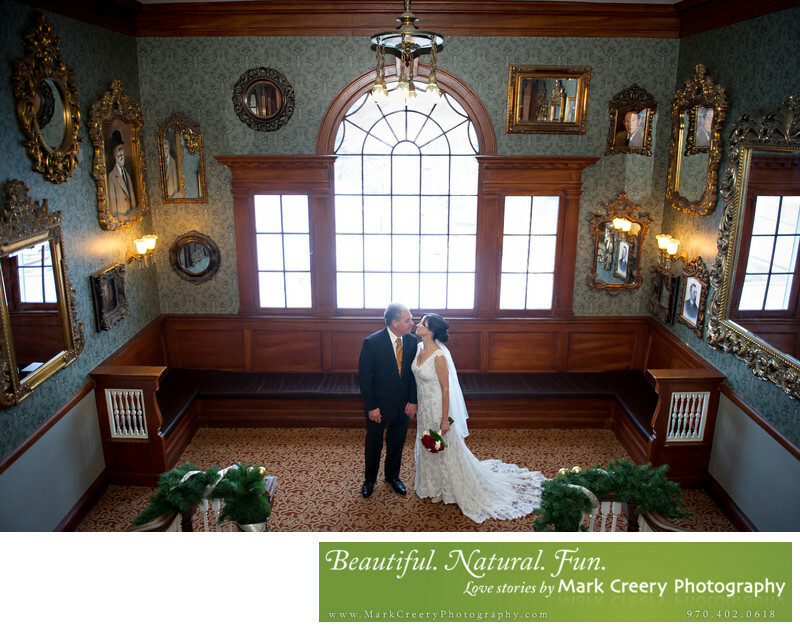 Estes Park wedding photographer Mark Creery Photography captures timeless, natural wedding photos. Whether it be inside the historic Stanley Hotel for a romantic elopement or outdoors overlooking the majestic mountains, Mark knows how to capture the personalities of a couple while highlighting the beauty that Estes Park offers. This portrait of the bride and groom was taken between the first and second floors of the classic hotel, with lots of vintage mirrors and paintings of famous Estes Park residents. The couple had an intimate wedding with just the two of them in the Library at the Lodge. After the indoor photographs we went outside to capture the sweeping views of the mountains, with some late Fall snow on the ground. The Stanley Hotel has many ceremony and reception options. For outdoor ceremony sites there is the Front Lawn with room for 200, the Lower Lawn with capacity for 80, Longs Peak Lawn (120), Trail Ridge Oval (40 guests), Wonderview Terrace (150), with it's newly planted cedar hedges, Presidential Patio (100), The Pines (100), Concert Hall Patio (12), Concert Hall Patio (120), and Rose Garden Gazebo (5). For indoor reception options there are the MacGregor Ballroom (up to 200 guests), Concert Hall (200), Pinon & Billiard (90), Music Room (70), and Library (60). Location: Stanley Hotel, Estes Park, Colorado.